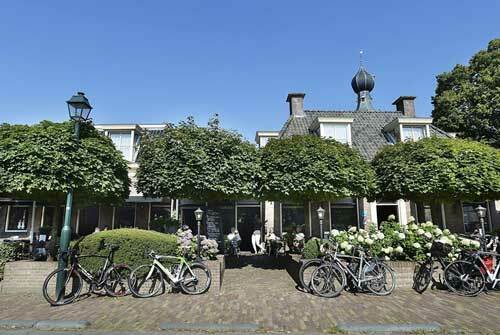 Grand Café de Brink has 10 hotel rooms. We work closely together with Hotel & Restaurant Wesseling, just across the street. Our hotel rooms are fully equipped and easily accessible with an elevator. After a good night sleep, start your day at our rich breakfast buffet: delicious fresh bread, meats, cheeses, juices and an egg prepared the way you prefer. You can enjoy breakfast in the cosy restaurant of Hotel & Restaurant Wesseling, just opposite the street. For any snack, lunch or dinner you can choose from the à la carte menu or café menu of Grand Café De Brink. Both menus offer plenty of choice, from delicious salads to surprising tapas. In addition, you are always welcome to visit Hotel & Restaurant Wesseling, where we offer a French-inspired brasserie menu. Both the terraces of Grand Café De Brink and Hotel & Restaurant Wesseling are known for their sunny sitting areas with very comfortable lounge sofas. Rest assured, inside you will enjoy just as much, in our cosy bar you have a great view on the charming Brink Dwingeloo. Especially for families, we propose our kids offer. They stay for free! Upon arrival, your children will be surprised with a nice present in the room! From Monday to Friday your kids will stay for free in one of our spacious family rooms in Grand Café De Brink. Their breakfast is on us as well. This promotion is available during official school holidays, with the exception of the summer holidays. This promotion can only be booked directly with the hotel. Staying together in Dwingeloo? Our Double room has a surface of 25m2, with two single beds. Room facilities Sitting area with desk, safe, walk-in closet, telephone, radio, flat screen television with cable. Bathroom Bath or shower, hairdryer, toiletries and toilet. Visit Drenthe together with your family. Stay in one of our Family rooms. It has a surface of 40m2, it offers 2 single beds and a sofa bed. Roomfacilities Sitting area with desk, safe, walk-in closet, telephone, radio, flat screen television with cable. Bathroom Bath or shower, hairdryer, toiletries and toilet.